This polaroid was included with my gift from my Nana this year. It's she and I, in the late 1980's (don't let the decor deceive you into thinking it was the 70s), in her "Rec Room" where her sewing machines and oodles of fabric lived, and where she spent a majority of her time. 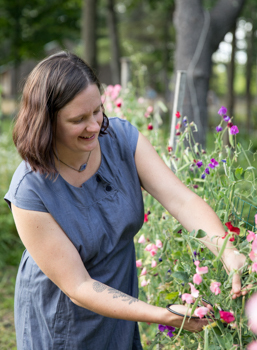 I don't think I've mentioned her much here before, which seems kind of silly, really, since she's the one who taught me to sew, and tried to teach me to knit, and many other things. As a child, I would spend the weekend with her, starting with a trip to the fabric store for a pattern and fabric. And then to her Rec Room we would go, where we would work away for the weekend, watching Lawrence Welk and Wheel of Fortune, and talking about many important things. All while learning, envying, watching, and sometimes dreading her very meticulous skills of sewing. My grandfather, "Bumpa" would come in from time to time to stoke the woodstove, tell a colorful joke, and supervise the project for a few minutes before he'd head back out into his garage, or into the woods. And at the end of the weekend, I'd head back to my house with something I had made, and of course now I know - so very much more than that. 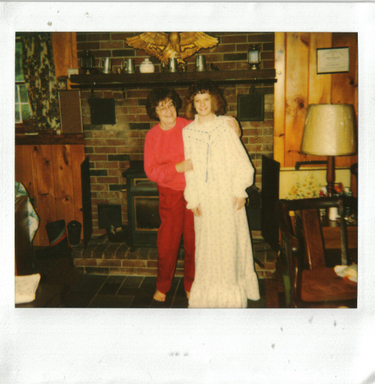 On the back of this polaroid is Bumpa's shakey, but still perfect scrawl of "Nana and Amy in her newly made nightgown - 2/21/88". I vaguely remember this nightgown (I remember that lace and ribbon at the bodice driving me nuts. I'm as impatient of a seamstress as I ever was), but oh, how I'll now treasure this photo. As they do, things have changed much since then. Sadly, my Bumpa has passed away. My Nana is no longer working out of her Rec Room, but out of a small condo. And at 80something, her eyesight is not what it used to be. But none of that has slowed her down a bit, as far as I can see. She spends most of her day working on sewing and knitting projects for her children, grandchildren, and great grandchildren. And this Christmas, just like every other Christmas I've ever known, was full of handmade goods from Nana. There's always been a hat, mittens, new sweater, or quilt for everyone under her tree. 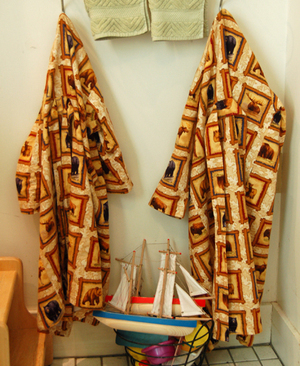 The boys got these matching bathrobes from her this year. With their names embroidered on the chest (because she's all about her embroidery machine - she's a Bernina lover too). They, of course, adore the fabric. 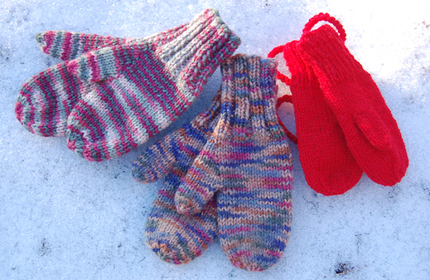 And a new pair of mittens for each babe. I wonder how many pairs of mittens she's made in her lifetime. Like so many women before her, and so many after her - creating them out of need for the ones she loves. But a whole lifetime of them? That's a lot of mittens, a lot of (acrylic) yarn. And a lot of love, too.